Nonenhanced axial CT image at the level of the origin of the great vessels demonstrates a nasogastric tube in place. The esophageal wall is thickened circumferentially and exerts mass effect on the posterolateral tracheal wall. 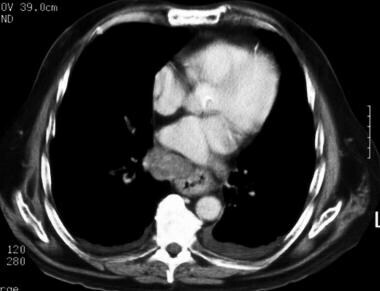 Infiltration of the mediastinal fat adjacent to the great vessels is present. Findings are consistent with esophageal carcinoma with tracheal invasion. Lateral barium esophagram demonstrates a large, intraluminal, lobulated filling defect diagnosed as esophageal carcinoma during endoscopic biopsy. Barium esophagography is a useful initial examination in the evaluation of a patient with esophageal complaints because it allows the assessment of esophageal morphology and motility. Esophageal endoscopy permits direct inspection and biopsy of the esophageal mucosa for histologic diagnosis. For the purpose of staging esophageal carcinoma, EUS, contrast-enhanced CT, and PET each offer unique information. Barium esophagography has optimal sensitivity for the detection of lesions when a double-contrast technique is used. Such technique requires that the patient be able to stand upright, which may not be possible with patients who are debilitated. For bulkier obstructive lesions, an air-contrast technique may not be possible, and a detailed mucosal examination may not be achieved distal to the obstruction. A notable limitation of CT in diagnosis involves the characterization of lymph nodes. With CT scans, size criteria are used to determine possible metastatic involvement; however, lymph nodes may be enlarged because of infectious or inflammatory etiologies. Conversely, subcentimeter lymph nodes may harbor metastatic tumor. Ultrasonographic examinations are highly operator dependent. Limitations of EUS with the standard Olympus diagnostic echo-endoscope (13 mm in diameter) include an inability to pass the malignant stricture with the transducer. This limitation results in an incomplete examination, which occurred in 40% of patients reported by Massari et al. However, the use of a dedicated 8-mm-diameter esophagoprobe for EUS allows complete examination in most patients. With PET, the resolution and cost remain the primary limitations. Subcentimeter foci of tumor metabolism may not be detected. Barium esophagography is unique among esophageal studies for assessing both morphology and motility. Barium esophagography remains the study of choice for characterization of esophageal strictures. Esophageal carcinoma may demonstrate a variety of appearances on barium esophagrams. See the images below. Anteroposterior barium esophagram demonstrates an abrupt change in the caliber of the esophagus, with a long, irregular, annular stricture of the thoracic esophagus. Note the masslike shouldering at the proximal extent of the lesion at which filling defects are present within the dilated esophageal lumen. Findings are most consistent with esophageal carcinoma. Lateral barium esophagram demonstrates an abrupt change in the caliber and contour of the esophagus caused by an irregular circumferential stricture containing focal ulcerations. Findings are most consistent with esophageal carcinoma. Lateral barium esophagram demonstrates marked irregular narrowing of the esophageal lumen with focal ulcerations and almost complete obstruction; these findings are consistent with esophageal carcinoma. Lesions may be annular and constricting; intraluminal, polypoid, or masslike; infiltrative; ulcerating; or varicoid. A mixed pattern is most common. Early esophageal carcinoma may present as a small polypoid lesion or as coalescent plaques or nodules. A double-contrast technique should be used for optimal sensitivity. The length and location of the involved esophageal segment and the functional impairment resulting from the lesion should be reported. Once a malignancy is detected on barium examination, the radiologist must be careful to evaluate the remainder of the esophagus and stomach for synchronous lesions. Endoscopy should follow. The morphologic pattern of the lesion on barium esophagrams establishes the need to consider the differential diagnoses. Contrast-enhanced CT plays an important role in the staging of esophageal carcinoma. Attention is directed to determining the extent of the local tumor; invasion of mediastinal structures; involvement of supraclavicular, mediastinal, or upper abdominal lymph nodes; and distant metastases. These observations are useful in distinguishing between T3 and T4 lesions and in determining the N and M status. See the images below. 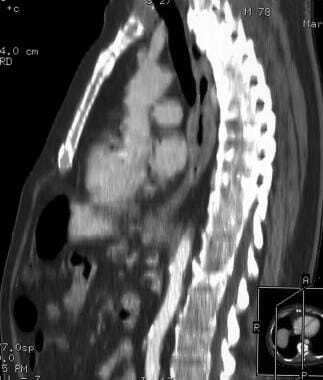 Sagittal reformatted chest CT scan demonstrates marked, long-length, esophageal wall thickening abutting the posterior tracheal wall. Tracheal invasion by esophageal carcinoma was found at bronchoscopy. Enhanced axial CT image demonstrates irregular wall thickening of the esophagus. A heterogeneously enhancing mass to the right of the esophagus represents a markedly enlarged metastatic lymph node. No significant loss of the fat plane is noted between the esophageal mass and the descending thoracic aorta, indicating the absence of aortic invasion. Small bilateral pleural effusions are present. Nonenhanced axial CT image demonstrates a large proximal esophageal mass with asymmetric impression on the posterior tracheal wall, suggestive of invasion. Recall that the posterior tracheal wall may bow inwardly (usually symmetrically) during expiration because of incomplete tracheal cartilage rings. Infiltration of the peri-esophageal fat is demonstrated, although no evidence of aortic invasion is present. 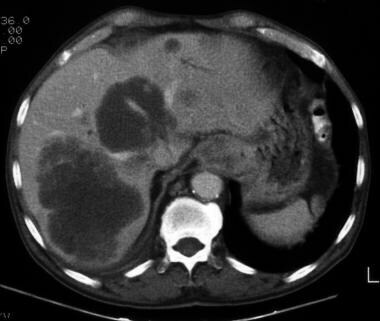 Enhanced axial CT image demonstrates a large esophagogastric junction carcinoma and several large liver lesions, with heterogeneous peripheral contrast enhancement and irregular margins consistent with metastases. 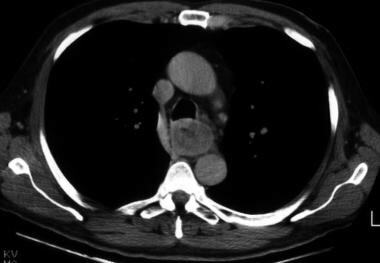 CT examination should extend from the thoracic inlet through the liver. Routine oral contrast material should be administered. This may be positive contrast agent, such as dilute barium, or a negative intraluminal contrast medium, such as water. A low-density 3% weight-for-weight esophageal barium paste may be administered immediately prior to scanning. Techniques for virtual esophageal endoscopy have also been described using effervescent granules and glucagon. Eccentric or circumferential wall thickening is greater than 5 mm. Peri-esophageal soft tissue and fat stranding may be demonstrated. A dilated fluid- and debris-filled esophageal lumen is proximal to an obstructing lesion. Tracheobronchial invasion appears as displacement of the airway (usually the trachea or left mainstem bronchus) as a result of mass effect by the esophageal tumor. Absence of a fat plane between the airway and the esophageal mass cannot be used as an indication of invasion. Even in patients without esophageal carcinoma, a fat plane is usually not evident between the esophagus and left mainstem bronchus. Note that the tracheal cartilage rings are incomplete posteriorly, which allows the posterior wall of the trachea to bow anteriorly during expiration; therefore, it is important that CT images be acquired during full inspiration. Aortic invasion may be assessed in 2 ways. The Picus method considers the arc of contact between the tumor and aorta. Loss of the periaortic fat plane over less than 45° suggests no aortic invasion, whereas contact over 90° or more is predictive of invasion of the aortic wall. Contact between 45° and 90° is indeterminate. Accuracy with this method is 80%. Obliteration of the triangular fat space between the aorta, esophagus, and spine is another predictor of aortic invasion. A careful search for lymph nodes is an essential component of the interpretation. A short-axis diameter exceeding 1 cm is considered abnormal for lymph nodes in all mediastinal locations except those in the subcarinal region, in which 1.4 cm is the upper limit of normal. Because lymph nodes may harbor metastases without being enlarged, noting the location of any identified lymph nodes is important. In addition, remembering that lymph nodes may be enlarged because of inflammatory or infectious etiologies is important. Esophageal carcinoma is often metastatic at presentation. Reviewing a cohort of 116 cases of predominantly esophageal squamous cell carcinoma, Margolis et al determined that a solitary lung nodule found at the time of diagnosis is more likely to be a benign abnormality or a primary lung cancer than a metastatic lesion. However, during terminal phases of the disease, lung metastases are increasingly common. Multiple groups have reported on the sensitivity and specificity of CT in determining lymph node involvement. Its sensitivity for the detection of lymph node metastases is in the range of 60-80%. Its specificity is higher, approximately 90%. An impression of tracheal invasion may be caused by expiratory bowing of the posterior trachea. Lymph node metastases may be present without enlarged lymph nodes, and lymph node enlargement may not be the result of malignancy. Lesions in solid organs identified at CT may represent primary benign or malignant processes or metastatic disease, and biopsy is frequently necessary to obtain histologic proof. MRI presents the advantage of direct multiplanar imaging capabilities, which may be of particular use in assessing tracheobronchial, aortic, and pericardial invasion. Currently, MRI has not yielded other significant advantages compared with CT in the staging of esophageal carcinoma. Preliminary studies have shown that the sensitivity and specificity of MRI for the determination of tumor invasion are equivalent to those of CT.
False-positive and false-negative findings are similar to those seen on CT scans. Unlike CT, EUS allows visualization of the distinct layers within the esophageal wall. Alternating circumferential layers define the mucosal interface (hyperechoic), the mucosa (hypoechoic), the submucosa (hyperechoic), the muscularis propria (hypoechoic), and the adventitial interface (hyperechoic). Such resolution permits the distinction of T1, T2, T3, and T4 tumors. Esophageal carcinoma appears as a hypoechoic lesion disrupting the normal circumferential layers. However, with standard EUS equipment, often only 3 layers are seen in the esophageal wall: the mucosa and submucosa (hyperechoic), the muscularis propria (hypoechoic), and the adventitial interface (hyperechoic). Local lymph nodes are also demonstrated by using EUS. Nodes are considered malignant if they are round, if they are hypoechoic, and if they have well-defined borders. Usually, benign nodes are hyperechoic and less well defined. At this time, only EUS is useful in distinguishing T1 and T2 lesions. Radiopharmaceuticals other than FDG can be used in PET imaging. Carbon-11 choline has received particular attention. Choline, a component of the cell membrane, is taken up by actively dividing cells. In theory, this agent provides some advantages over FDG. Uptake of FDG requires that the tumor derive a portion its energy supply from glycolysis, an anaerobic condition that exists when the oxygen supply to some part of the tumor is low. For example, this circumstance may occur when a tumor outgrows its arterial supply. On the other hand, the uptake of11 C-choline requires only the presence of cell division. Cardiac uptake of FDG may be significant, even in the fasting state, and this characteristic complicates the interpretation of findings in the mediastinum. Conversely, cardiac uptake is not significant with11 C-choline. 11 C-choline PET scanning has been shown to outperform FDG PET scanning in the detection of malignant mediastinal lymph nodes. 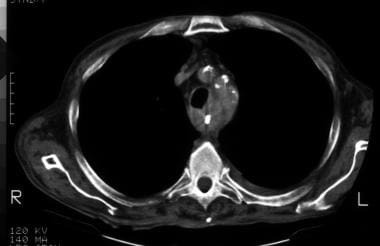 With this agent, tumor-containing mediastinal lymph nodes as small as 4 mm have been identified. The short half-life of11 C-choline (approximately 20 min) will likely limit its use to major academic centers. The agent is not useful in the abdomen because of intense liver uptake. FDG PET scanning remains the technique of choice for the detection of metastatic abdominal lymph nodes. Flamen et al performed a prospective study to compare the staging of esophageal carcinoma with FDG PET versus the combination of CT and EUS in 74 patients. For T stages, FDG PET scanning demonstrated increased activity in the primary tumor in 70 patients (95% sensitivity). Four proven T1 lesions had negative findings on FDG PET scans. FDG PET scans may fail to demonstrate T1 primary lesions. Inflammatory processes cause increased uptake of FDG. In addition, patients with no esophageal pathology may have minimal esophageal FDG uptake, particularly in distal areas. Lantos JE, Levine MS, Rubesin SE, Lau CT, Torigian DA. Comparison between esophagography and chest computed tomography for evaluation of leaks after esophagectomy and gastric pull-through. J Thorac Imaging. 2013 Mar. 28(2):121-8. [Medline]. Li R, Chen TW, Hu J, Guo DD, Zhang XM, Deng D, et al. Tumor volume of resectable adenocarcinoma of the esophagogastric junction at multidetector CT: association with regional lymph node metastasis and N stage. Radiology. 2013 Oct. 269(1):130-8. [Medline]. Heidemann J, Schilling MK, Schmassmann A, et al. Accuracy of endoscopic ultrasonography in preoperative staging of esophageal carcinoma. Dig Surg. 2000. 17(3):219-24. [Medline]. Rankin SC, Taylor H, Cook GJ, Mason R. Computed tomography and positron emission tomography in the pre- operative staging of oesophageal carcinoma. Clin Radiol. 1998 Sep. 53(9):659-65. [Medline]. Takashima S, Takeuchi N, Shiozaki H, et al. Carcinoma of the esophagus: CT vs MR imaging in determining resectability. AJR Am J Roentgenol. 1991 Feb. 156(2):297-302. [Medline]. Gao F, Li C, Gu Y, Huang J, Wu P. CT-guided 125I brachytherapy for mediastinal metastatic lymph nodes recurrence from esophageal carcinoma: effectiveness and safety in 16 patients. Eur J Radiol. 2013 Feb. 82(2):e70-5. [Medline]. Canova C, Hashibe M, Simonato L, Nelis M, Metspalu A, Lagiou P, et al. Genetic Associations of 115 Polymorphisms with Cancers of the Upper Aerodigestive Tract across 10 European Countries: The ARCAGE Project. Cancer Res. 2009 Apr 1. 69(7):2956-65. [Medline]. Yamashita H, Nakagawa K, Yamada K, Kaminishi M, Mafune K, Ohtomo K. A single institutional non-randomized retrospective comparison between definitive chemoradiotherapy and radical surgery in 82 Japanese patients with resectable esophageal squamous cell carcinoma. Dis Esophagus. 2008. 21(5):430-6. [Medline]. Massari M, Cioffi U, De Simone M, et al. Endoscopic ultrasonography for preoperative staging of esophageal carcinoma. Surg Laparosc Endosc. 1997 Apr. 7(2):162-5. [Medline]. Levine MS, Halvorsen RA. Esophageal carcinoma. In: Gore RM, Levine MS, Laufer I, eds. Textbook of Gastrointestinal Radiology. Philadelphia: WB Saunders Co. 1994:446-78. Levine MS, Chu P, Furth EE, et al. Carcinoma of the esophagus and esophagogastric junction: sensitivity of radiographic diagnosis. AJR Am J Roentgenol. 1997 Jun. 168(6):1423-6. [Medline]. Mazzeo S, Caramella D, Gennai A, et al. Multidetector CT and virtual endoscopy in the evaluation of the esophagus. Abdom Imaging. 2004 Jan-Feb. 29(1):2-8. [Medline]. Chen TW, Yang ZG, Li Y, Li ZL, Yao J, Sun JY. Quantitative assessment of first-pass perfusion of oesophageal squamous cell carcinoma using 64-section MDCT: initial observation. Clin Radiol. 2009 Jan. 64(1):38-45. [Medline]. Yin LL, Yang ZG, Li Y, Yu JQ, Bai HL. [Preliminary study of tumor perfusion assessment with multidetector CT in carcinoma of esophagus and cardia]. Sichuan Da Xue Xue Bao Yi Xue Ban. 2008 Sep. 39(5):788-91. [Medline]. Picus D, Balfe DM, Koehler RE, et al. Computed tomography in the staging of esophageal carcinoma. Radiology. 1983 Feb. 146(2):433-8. [Medline]. Quint LE, Hepburn LM, Francis IR, et al. Incidence and distribution of distant metastases from newly diagnosed esophageal carcinoma. Cancer. 1995 Oct 1. 76(7):1120-5. [Medline]. Margolis ML, Howlett P, Bubanj R. Pulmonary nodules in patients with esophageal carcinoma. J Clin Gastroenterol. 1998 Jun. 26(4):245-8. [Medline]. Ozawa S, Imai Y, Suwa T, Kitajima M. What's new in imaging? New magnetic resonance imaging of esophageal cancer using an endoluminal surface coil and antibody-coated magnetite particles. Recent Results Cancer Res. 2000. 155:73-87. [Medline]. Rasanen JV, Sihvo EI, Knuuti MJ, et al. Prospective analysis of accuracy of positron emission tomography, computed tomography, and endoscopic ultrasonography in staging of adenocarcinoma of the esophagus and the esophagogastric junction. Ann Surg Oncol. 2003 Oct. 10(8):954-60. [Medline]. Kim K, Park SJ, Kim BT, et al. Evaluation of lymph node metastases in squamous cell carcinoma of the esophagus with positron emission tomography. Ann Thorac Surg. 2001 Jan. 71(1):290-4. [Medline]. Meltzer CC, Luketich JD, Friedman D, et al. Whole-body FDG positron emission tomographic imaging for staging esophageal cancer comparison with computed tomography. Clin Nucl Med. 2000 Nov. 25(11):882-7. [Medline]. Kwee RM, Marcus C, Sheikhbahaei S, Subramaniam RM. PET with Fluorodeoxyglucose F 18/Computed Tomography in the Clinical Management and Patient Outcomes of Esophageal Cancer. PET Clin. 2015 Apr. 10 (2):197-205. [Medline]. Choi JY, Lee KH, Shim YM, et al. Improved detection of individual nodal involvement in squamous cell carcinoma of the esophagus by FDG PET. J Nucl Med. 2000 May. 41(5):808-15. [Medline]. Goense L, van Rossum PS, Reitsma JB, Lam MG, Meijer GJ, van Vulpen M, et al. Diagnostic performance of 18F-FDG and PET/CT for the detection of recurrent esophageal cancer after treatment with curative intent: a systematic review and meta-analysis. J Nucl Med. 2015 May 7. [Medline]. Flamen P, Lerut A, Van Cutsem E, et al. Utility of positron emission tomography for the staging of patients with potentially operable esophageal carcinoma. J Clin Oncol. 2000 Sep 15. 18(18):3202-10. [Medline]. Flanagan FL, Dehdashti F, Siegel BA, et al. Staging of esophageal cancer with 18F-fluorodeoxyglucose positron emission tomography. AJR Am J Roentgenol. 1997 Feb. 168(2):417-24. [Medline]. Kobori O, Kirihara Y, Kosaka N, Hara T. Positron emission tomography of esophageal carcinoma using (11)C- choline and (18)F-fluorodeoxyglucose: a novel method of preoperative lymph node staging. Cancer. 1999 Nov 1. 86(9):1638-48. [Medline]. Oblique barium esophagram demonstrates a focal, fixed, concave contour deformity of the posterior esophageal wall. This represents superficial spreading esophageal carcinoma.